Posted October 1, 2017 by Sean McDowell and filed under the categories #SundayWithSean, Apologetics, Resurrection. 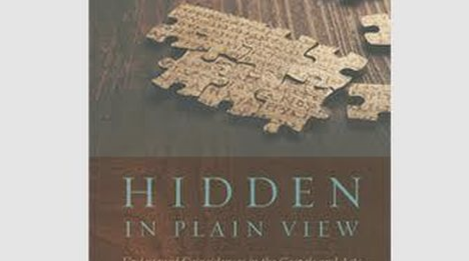 Lydia McGrew has written a fascinating book in defense of the reliability of the New Testament called Hidden in Plain View, which officially releases March 1. I first heard about it because she gave me the privilege of endorsing it along with William Lane Craig, J. Warner Wallace, Craig Keener, and others. To be honest, I was blown away with her reasoning and conclusions. Even though I have been studying apologetics for over two decades, her approach in this book was new to me. My father and I were so impressed that we have included (with her permission) a small section from the book in the upcoming update of Evidence that Demands a Verdict (Fall, 2017). Lydia was kind enough to briefly answer a few of my questions, as you can see below. Check out this interview, and–whether you are a skeptic or a believer–consider getting a copy of her excellent book and studying it carefully. She makes a fresh, unique, and weighty argument in favor of the reliability of the NT that deserves to be heard far and wide. SEAN MCDOWELL: How did you come up with the idea of unintended coincidences as support for the reliability of the NT? LYDIA MCGREW: I learned about it from my husband, Tim McGrew. He discovered the argument in old writers and has been reintroducing it through his lectures. MCDOWELL: What is an unintended coincidence? MCGREW: This is how I define it in the book: An undesigned coincidence is a notable connection between two or more accounts or texts that doesn’t seem to have been planned by the person or people giving the accounts. Despite their apparent independence, the items fit together like pieces of a puzzle. Undesigned coincidences are often best understood by examples. MCDOWELL: Can you give me one example? MCGREW: Sure, I’m just going to sneak in two here: In John 13 we’re told that Jesus got up after eating the Last Supper and washed the disciples’ feet. It just sort of happens out of the blue. Reading only John, you might think that Jesus thought of this idea for no special reason, and it does raise the question, “Why did he do that just then?” If you go over to Luke 22, though, there is an explanation: It says that the disciples had been bickering at that very meal about who would be greatest in the kingdom. So the foot-washing in John is explained. Jesus was giving them an example of humility and service when they had just been competing and fighting. Luke never mentions the foot-washing, and John never mentions the argument. Those same two passages have a coincidence in the other direction. In Luke, Jesus scolds the disciples for bickering and says, of himself, that though he is their master, “I am among you as the one who serves.” This is a slightly weird expression in Luke, because he hasn’t done anything especially servant-like. But if you read about the foot-washing in John, you see that he has just dressed himself like a servant and washed their feet. He has literally been among them as one who serves. So the two passages fit together extremely tightly because of what each one contains and each one leaves out. Luke explains John, and John explains Luke. MCDOWELL: How does your book differ from the approach that is based on historical criteria that defend particular passages or sayings of Jesus? The criteriological approach applies only to specific passages that “pass” one of the criteria, such as the criterion of embarrassment, multiple attestation, earliness, etc. The idea of that approach is that even if these books turn out not to be substantially reliable, we can use these criteria to mine gems of historical information out of them. In contrast, I’m trying to test the hypothesis that these books are historically reliable overall and do come from eyewitness sources. The undesigned coincidences are what we expect to find in accurate witness testimony, and they support the reliability of the Gospels and Acts in general. MCDOWELL: How can undesigned coincidences support Acts? Unlike the Gospels, Acts is only one historical book, so we don’t have multiple historical accounts of the same incident. MCGREW: Undesigned coincidences support Acts through the connection with Paul’s epistles. Sometimes we really do have multiple accounts of the same incident in one of the letters and in Acts (like Paul’s escape from Damascus in a basket), but even more often we have these great indirect coincidences where Paul’s statements in the letters show where he was at certain times, who was with him, and even where he intended to go, and Acts confirms these same things. This provides strong evidence that the author of Acts was a companion of the Apostle Paul. MCDOWELL: How do undesigned coincidences fit with the hypothesis that a later Gospel like John added incidents and words to the life of Christ that didn’t really happen? MCGREW: They give us very strong evidence against that theory. In fact, John, the Gospel written latest, is the Gospel that has its unique material most often confirmed by undesigned coincidences. The more new material John provides, the more opportunities there are for John to be confirmed by dovetailing with the other Gospels. « Do Miracles Still Happen Today?